We have two brochures available. Both contain maps to locate some of the notable individuals who call the Princeton Cemetery their final resting place. Our printed brochure is available at the entrance to the cemetery on Greenview Ave, (in the green map box labeled “Maps” as you pass through the cemetery gates on the left) and at Nassau Presbyterian Church. 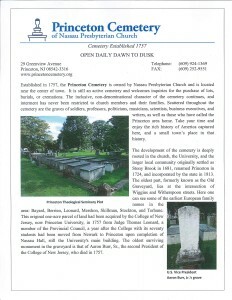 Since all people have a story to tell, we have limited this brochure to include only a select number of the nation ally, internationally, and locally prominent individuals buried in Princeton Cemetery.